Welcome back to trout season!! With what was one of the hardest starts to any river season that I have seen it’s good to see that the trout are starting to show themselves! The weather has been fantastic the past couple of weeks and the days are certainly getting warmer. The bugs are stating to come out in numbers and the fish are starting to look up. 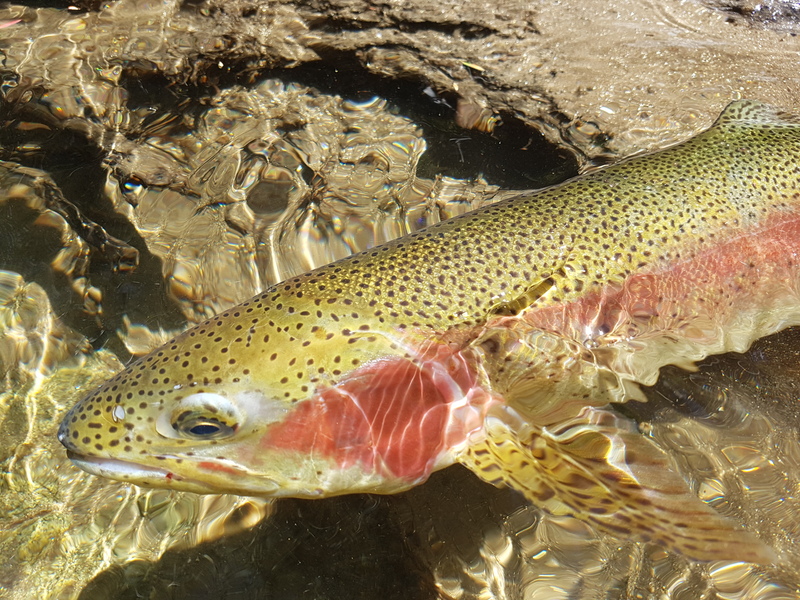 With a very poor rainbow run this year, the early season river fishing was tough to say the least! There were very few moving fish in the river and just a few residents were willing to come out and play. Although some nice fish were caught the numbers of overall catches was quite low. Thankfully it appears that the fishing is on the turn for the good. That doesn’t mean that you can drop your game, walking and stalking the banks and edges should be done carefully and fishing the undercuts and margins with a Dry-fly and dropper rig should be enticing enough to bring the big dogs out to play. A high riding dry fly such as a small Stimulator of Royal Wulff with a smaller lightly weighted nymph or soft hackle fly trailing around 14 to 16 inches behind the dry-fly gently drifted under the banks and through some tight pocket water usually do the trick. The middle of the day on some of the smaller streams have been producing some very reasonable fish on the Dry-fly, smaller CDC low ring flies have worked quite well, but you must ensure a drag-free drift to get good results. The past few evenings have seen some good termite and ant falls, these should continue over the next couple of weeks, particularly the still humid evening should see some solid ant falls as well as some caddis and mayfly hatches. There is also an abundance of frogs and tadpoles getting around. when the tadpoles are on the edges of the lake the brown trout tend to come in very close to gorge themselves on both the tadpoles and frogs. The lakes have been a fishing a little better lately, both lake Eucumbene and Jindabyne have been on the rise and is seeing some fish move closer in. Yabby patterns are proving to be the go to flies as they have been a very stable food source for the lake feeders and continue to eat them throughout the year even with massive lake level variations. A slow retrieve along the bottom with a bigger wooly bugger, Killer patterns, or one of the Yewchucks King Cray flies from manic will work great. The fishing is only going to get better from here on in, so come on down and get into some early season dry-fly fishing. The weather is great and the trout are coming out to play!!! Don’t forget to drop into the shop for a chat, stock up on some new flies, grab some gear, and find out where is fishing best! We are still waiting for some rain??? And it looks like it might be coming this weekend. According to the B.O.M. we should be getting a good downpour from Thursday night and should continue through friday, then maybe a chance of some more rain from Monday till Wednesday (fingers crossed) if the rain does finally come, it will certainly bring some fish into the rivers and streams in the area. 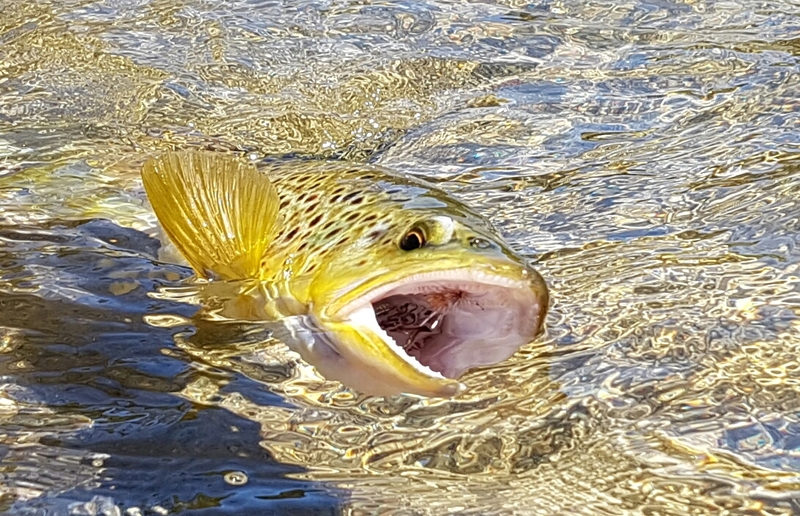 The past couple of weeks has seen some larger fish starting to move into both the Eucumbene and Thredbo rivers, although at this stage they look to be just scoping out some good breeding grounds and are very very spooky at the moment. 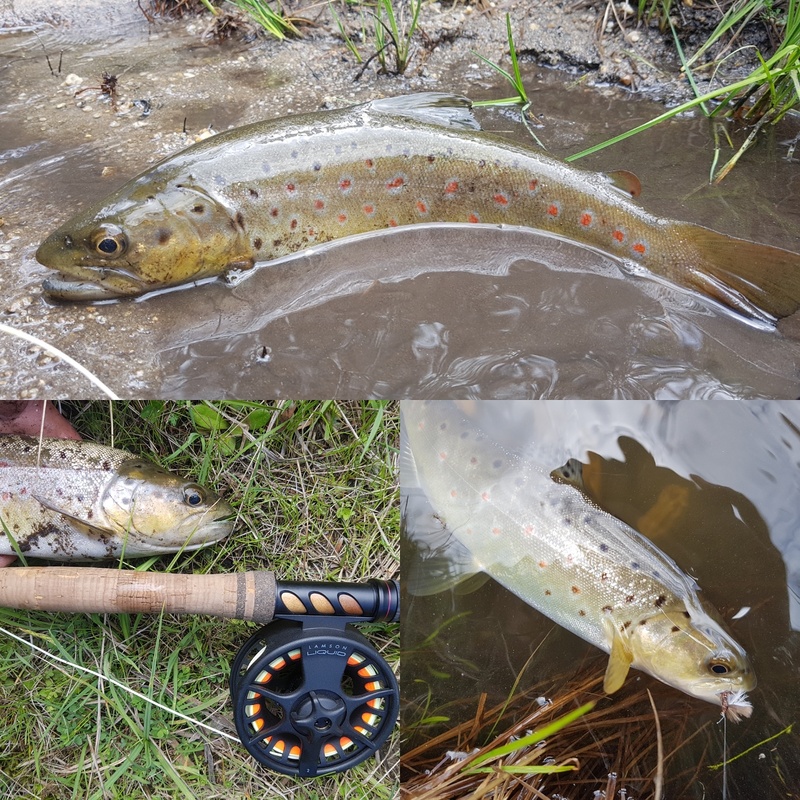 There is still some great dry-fly fishing to be had, although the overnight temperatures have been quite cool, there has been plenty of sunshine warming up the day and we are still seeing some good hatches of smaller mayflies and midge. There are also still a few hoppers around, but I’d say there days are numbered as we are starting to get a few good frosts in the morning. It’s a good time to start thinking about getting some flies below the surface. As the weather cools there is going to be less surface activity and a lot more sub-surface action. Nymphs and Glo-bugs are going to be the go to flies once there is some more water moving down the rivers and creeks. For those looking at trying something a little different during the spawning period, try swinging some big wet flies down and across for some very exciting takes from some big aggressive fish! 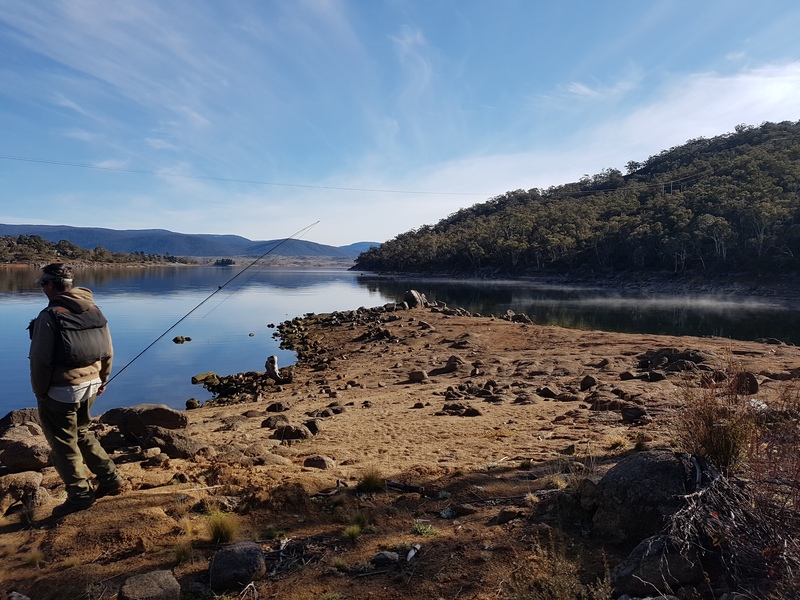 Lake fishing is starting to pick up on both lakes, with some good fish cruising around the newly exposed weed beds on Lake Jindabyne and yabbie beds on Eucumbene. There has been a lot of fluctuation on levels on both lakes this summer which has made it a little difficult for any solid food to establish around the edges, The best bet for getting into the lake fish is fishing deep at around 30-40ft. 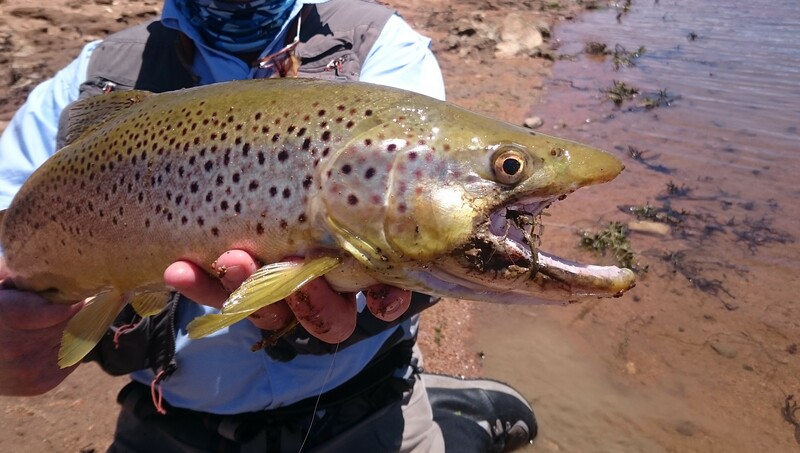 The smaller creeks around the area are still fishing quite well although are suffering from a lack of water. Just be aware that fish can die easily if not handled properly, and great care should be taken when releasing your catch. Remember that the May 1st bag and size limits are now in effect and that only one fish over 50cm is permitted with a 2 fish possession limit for trout spawning stream and rivers. With hopefully a bit of wet weather coming our way in the next few days the fishing should pick up and with only a few weeks left of the NSW Trout river season left, it would be a fantastic to end the season on a high after the fantastic season it was. Don’t forget to drop by the shop to grab some flies and supplies! or just call in for a catch up and find out where the fish are biting! Just when you thought it was safe to get in the water!! The last few days has been a little wet to say the least! But there is a light on the horizon! The weather should start to settle down in the next few days and hopefully summer will come back in full force!!! Even though the rivers and streams are running high, there are still some nice fish to be had! A little fine tuning of technique can get some good results. Down and across streamer fishing can get you into some action on the moving water, and there’s nothing quite like a take from an aggressively feeding fish!! Wooly buggers and heavy flies are you go to patterns for this technique, and if the water is running a little faster, a sink tip on the end of your fly line can help get the flies down to the fish!!! Another way of fishing high water on streams and creek is to fish the margins with a dry and dropper, placing a short cast into the slower moving water by the banks can entice a feeding fish from under the bank! Big dry flies that float well like Stimulators and big Wulff patterns with weighted nymph suspended couple of feet underneath can be deadly effective. 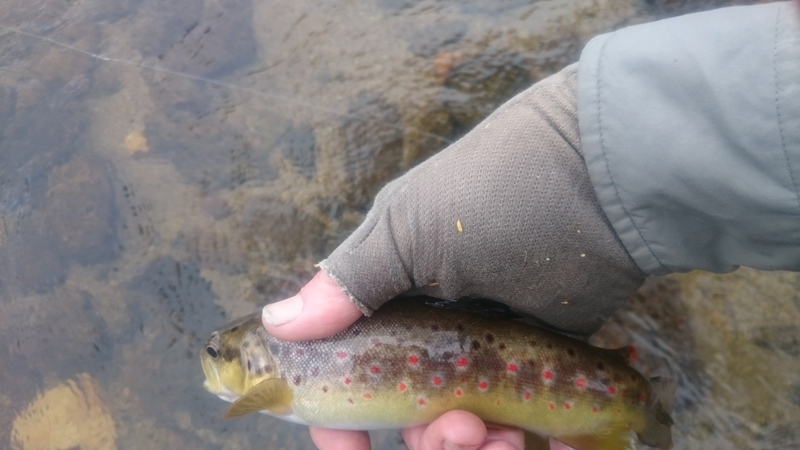 The Thredbo river is probably the pick of the rivers and streams when the water is running high and heavy as the smaller creeks can be a little harder to fish during these times, But remember that the fish have to eat! So try all options and work hard and slow to get the best results. Hopefully summer will make a return very shortly and we will be back into the dry-fly action again? Until then just think a little outside the box and you should still pick up a fish or two! Our fly shop is fully stocked and we have just about anything you need for a high country adventure! Drop in for a chat and pick up some flies and supplies! We’ll “hook you up” with whats fishing hot! In a market previously dominated by premium priced product for many years. Fly fishing is no longer the realm for the wealthy and elite. There was once a time when if the gear you were using didn’t cost as much as your car you just weren’t getting anything enjoyable to use. Well all that has changed. Echo, Airflo, and Vision are just some of the manufacturers that are making fly fishing fun much more affordable. Gone are the days when you had to spend $1000 on the rod alone. Now we can get high end performance, components, and looks all in a complete ready to fish package for less than the price of a mid range reel!! The Airflo Blade is the latest and greatest offering from the guys at Manic tackle projects. A couple of years ago they brought us the Nemesis, a rod that I personally have been using for the last little while and thought couldnt get much better, that was until the introduction of the Blade!!!! This package is simply AMAZING it has everything you would expect from a combo that is priced 3 times as much. From the moment you hold the rod in your hand to the moment you reel in the line on the Lamson Liquid (which I’m sure the click of the reel has been finely tuned to make the audible sound as appealing to humans as possible??) this outfit is all class. light in the hand with a beautiful swing weight. A smooth crisp blank with a lovely tip section that allows the angler to send out some deadly accurate tight loops with ease. lined with an Airflo Super Dri Elite taper fly line and packaged in a hard rod tube. It even comes with a spare tip and a “No Fuss” $50 section replacement warranty so you can purchase the Blade knowing that you’ll have this treasure for years to come!! The Echo Base Kit is everything I wish we had available when I first started my fly fishing journey. A very affordable, easy to use, honest to goodness casting and fishing rod that is happy in the hand of a newcomer to the sport or a seasoned angler with many seasons under their belt. Never before has a fly kit with this much bang for your buck been available. Available in #4 thru to #8 in sizes 8′ to 9′ you can now own a complete quiver of rods to suit just about any fishing situation for less than the price of one mid ranged set-up!!! The Base comes packaged as a combo with a Base reel, matched line, backing, and leader all in a rod and reel tube. Also has a lifetime warranty which gives you peace of mind. Vision have been doing great things for a while now, and with the introduction of the new Fisu combo into their range, they are another manufacturer that are making a very affordable product also. The Fisu is available in #4, #5, #6, and #8 outfits. Its is a medium to fast action rod that is fun and easy to cast. The blank has quality components and great quality cork handle and reel seat. 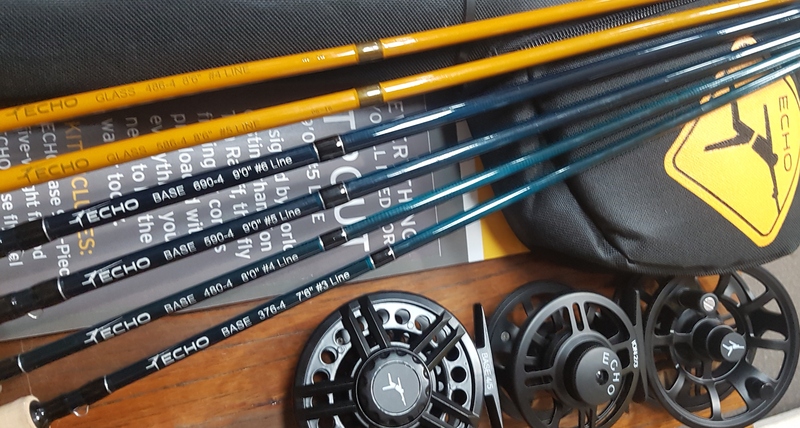 The Fisu is a great rod to have permanently stashed in the car for those just in case moments, or would make the perfect gift for the new fly angler. Grab a combo to fill the gap in your rod collection!! These are just some of the fantastic combos that we have in store this year, all of which any of us here in the shop would be more than happy to fish and cast on a regular basis. Come on in and have a cast of these price pointed gems that are as good as the best!!! After what seamed to be a never ending winter with some epic snow conditions not seen in years the time has finally come to get back into the rivers for some trouty goodness! There is plenty of snow on the hills and that means there’ll be plenty of water in the river and creeks for the next little while with all the snow melt. The season outlook looks set to be one of the best starts in years. 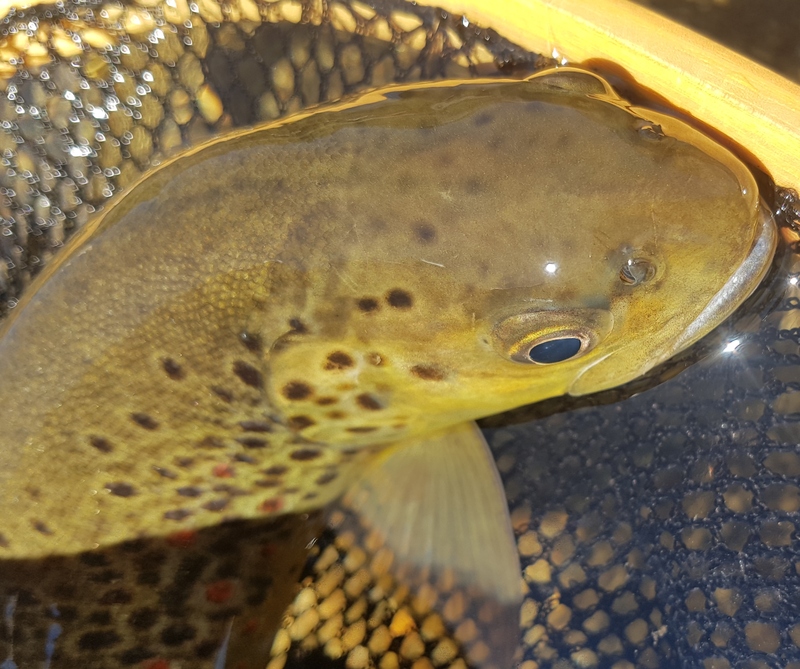 There are already plenty of fish in the waterways and the Hatchery have pulled the traps in the Thredbo river after getting their quota and now allowing for a greater natural recruitment into the system. The weather has definitely warmed up and we are seeing daytime temps well into the double digits (you might even see some early hatches and get some “Dry Time” very soon). The Rivers will be open to fish from midnight tonight!!! 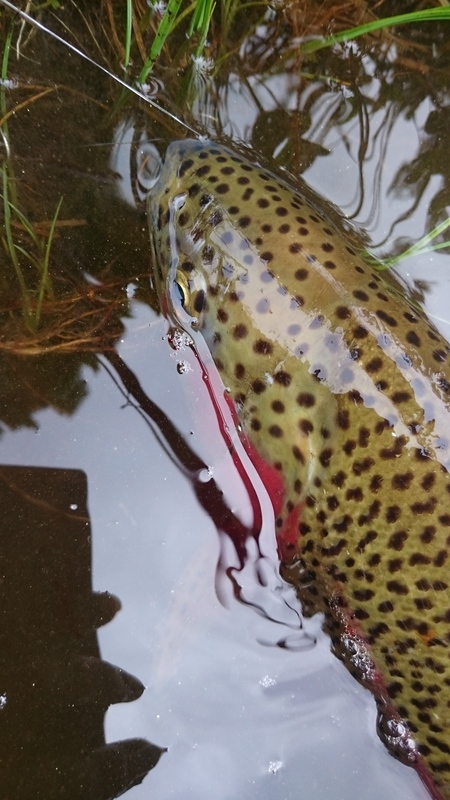 During the first couple of months of the river season we should still see some rainbow trout still in spawning mode. Be aware that these spawning fish are the lifeblood of our fishing, so please treat these fish carefully and return them to the water as soon as possible. For best results during the early part of the season a couple of nymphs fished below the surface should get you into the action. 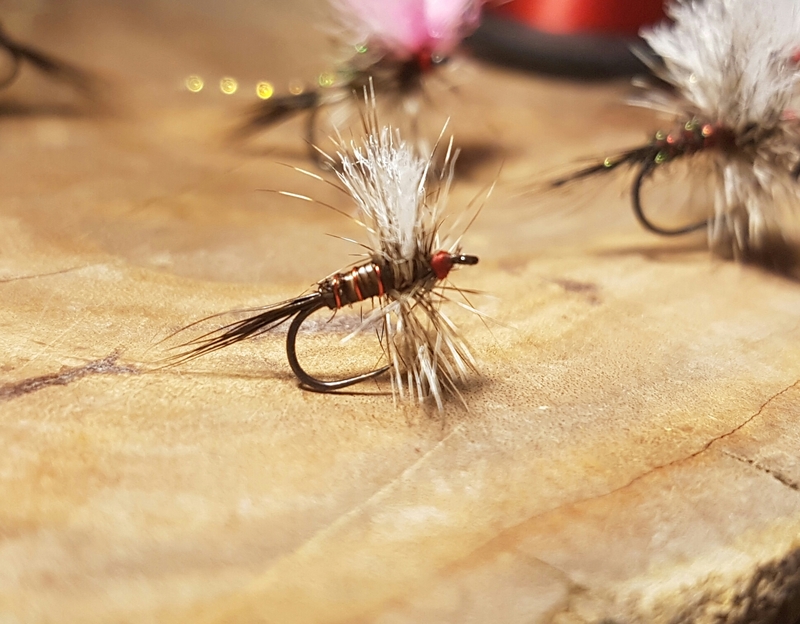 Standard patterns like Hare & Copper, Pheasant tail nymphs, Gold ribbed hares ear, and just about any natural colored Mayfly or Caddis fly Nymphs should do the trick. Fish them under an indicator for best results. With the warmer weather it could also pay to have some dry flies in your box as well. Elk Hair Caddis, Royal Wullfs, Stimulators, and Ant patterns in sizes 12 -18. The Lakes have been fishing reasonably well albeit a little slower than previous years, with Lake Eucumbene just out fishing Jindabyne by a fraction. The sight fishing on both lakes seems to be less productive than prospecting with some streamer patterns in the deeper water. Wooly Buggers and Killer patterns are working well. Our Fly Shop is now open and we have been very busy this winter searching for the latest and greatest fly fishing gear at some of the best prices ever!!!! With fantastic new products from Simms, Patagonia, Airflo, Scott, Redington, Sage, Lamson, Vision, and many many more. Get into High Country Outfitters for everything you need for your next fly fishing trip. Service, Sales, and Advice on everything Fly!!! The foreshore fishing is picking up and the trout are starting to come in nice and close to the edges. Lake Jindabyne water level is sitting at around 74%, and Lake Eucumbene is at 35%. With both lakes storage being low it makes for some great sight fishing opportunities (especially at this time of year) The polaroiding on both lake is about to go gang-busters. There have already been some great Mayfly hatches coming off the surface during the day and there have been a few browns cruising the edges taking them off the surface. Below the surface and in the deeper water there are plenty of yabbies for the fish to gorge themselves on. lake Eucumbene is fishing a little better than Jindabyne at the moment, but Jindabyne should pick up just as soon as we get a few warmer days. 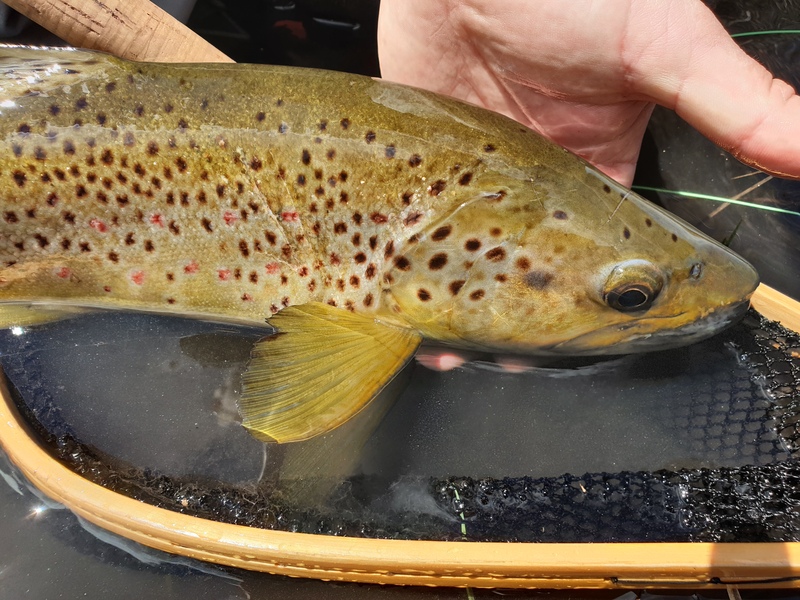 The low water levels of both lakes has exposed quite a few yabby beds and the browns have been coming right in close at night with some very good quality fish being caught, especially in the evenings. Wooly buggers slowly retrieved off the bottom seem to be working quite well, Killer patterns such as Hammils Killers and Mrs Simpsons will work very well also. This time of year is when the sight fishing comes into its own. The cooler days are becoming warmer and the edges are starting to show signs of bug-life. A slow walk around the lake armed with a small unweighted nymph can be some of the most exciting fishing you can get. The key to successful polaroiding is not to get too excited and cast to the fish as soon as you see it. Just relax and watch the fish! The fish will generally work a beat allowing you to predict its movements and letting you cast a small fly to the unsuspecting feeding trout!! Well at least that what we hope for!!?? 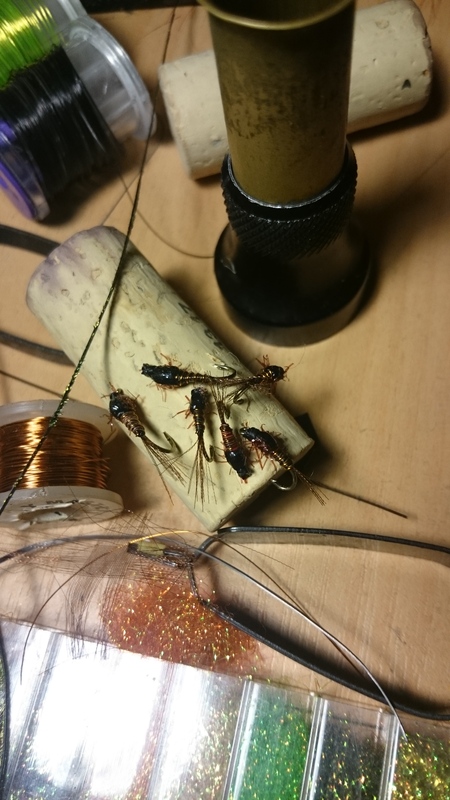 Small unweighted nymphs are my favorite flies for sight fishing at this time of the year, and would also pay to have a couple of smaller dry mayfly patterns handy as well. There is still plenty of snow on the ground and some forecast, so whether your into fishing or snow sports we have you covered. Come on down to Jindabyne for some of the best snow in years and you might even get yourself a trout?? There’s snow on the hills and frost on the ground!! 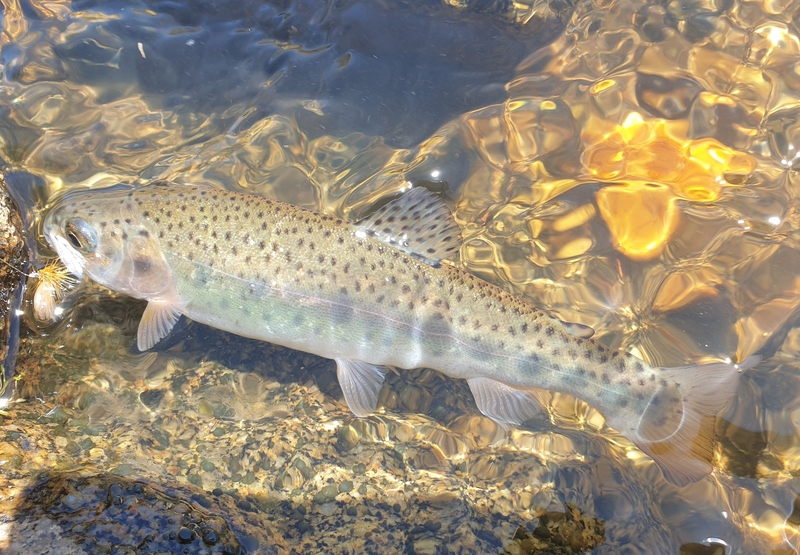 The trout rivers and streams have closed after a spectacular season. Now it’s time to focus on the lakes. Lake Jindabyne has seen a lot of water being let out into the lower Snowy river this week with some big environmental releases, with that we should see the lake level drop a little bit. Hopefully getting us a little closer to the weed beds and fish. Fishing the edges around drop-offs will be the best way to find some good fish, get your fly down deep and slowly retrieve a small Wooly Bugger or Black Nymph and hold on. The rainy windier days have proven to be the best times to get out and fish. The sunnier days have been very still and making the fishing a little tough leaving the angler very exposed to the fish making them quite wary to venture in close. evenings and mornings during these days will increase your chances of hooking up. Lake Eucumbene has been a little quiet lately with boat anglers having a little more success than the shore based angler. Although I have heard of a few reasonable fish being caught over the past couple of days from some fly-fishers prospecting with small nymphs and smaller “killer” style flies. Both lakes will continue to improve over the coming weeks as the edges really start cooling off. If your coming down for a snow holiday anytime soon don’t forget to pack a rod and experience winter trout fishing in one of our lakes that are open to fish all-year round. The frosts are here and there’s a chill in the air. 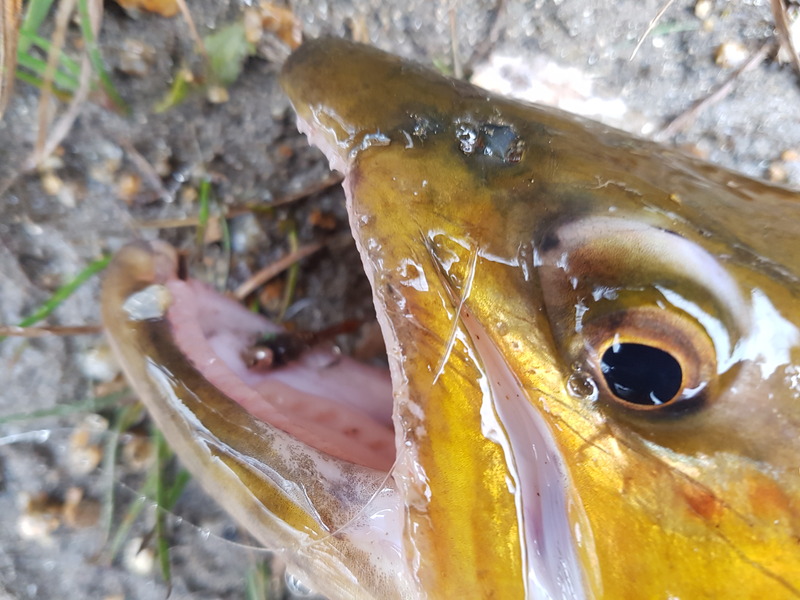 With just over a month left of the river fishing season, the rain has given them a long over due drink, and the brown trout are starting to show signs of some movement. The poplars have changed color and their leaves are starting to fall. The river fishing is still very good with some nice fish still being caught off the surface. There have been a few smaller beetles and the odd hopper still getting about, although with the colder weather and frosts their presence will be short lived. Its time to start looking below the surface. The Thredbo river has had a well deserved drink thanks to mother nature and is running at a great level right now and with some more rain forecast over the next little while it should remain at good level until the end of the season. The higher section of the river (above the Ski Tube) is still fishing a little better than the lower section, although I do see this changing over the next couple of weeks as there has already been signs of some brown trout starting their spawn run. Fishing the higher section with a dry and dropper should produce some good results. A simple combination of a smaller stimulator and a pheasant tail nymph or Hare & copper should work fine. The lower section would probably be fished best with a double nymph rig with an indicator or maybe even a glo-bug. 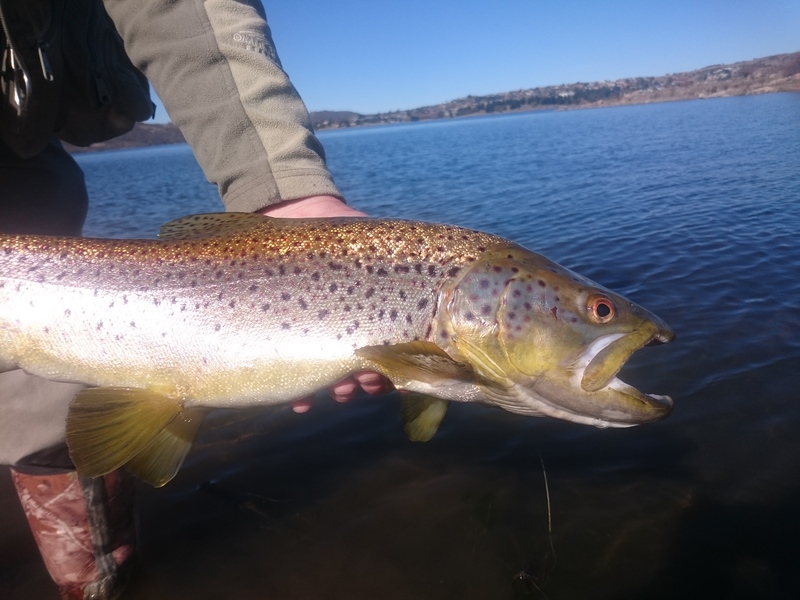 Lake Jindabyne has picked up a little with the cooler weather and a few good fish have been spotted and caught around the edges. The deeper water is still fishing better however so getting your flies down deeper is going to be an advantage. Wooly buggers and Killer patterns are still my favorite go-to flies. Lake Eucumbene has also picked up a little as well. The constant fluctuations of the lake have made the fishing quite erratic with one day being quite good and the next not so much. 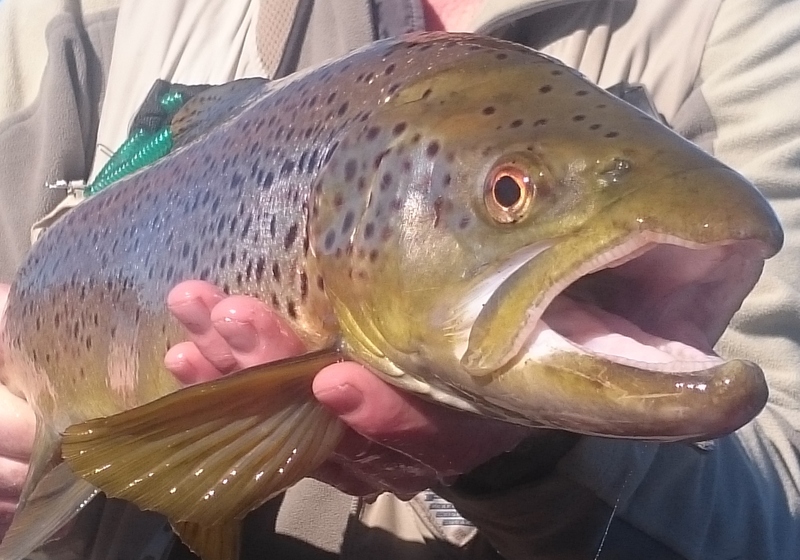 There has also been reports of browns starting to move up into the Eucumbene river as well. 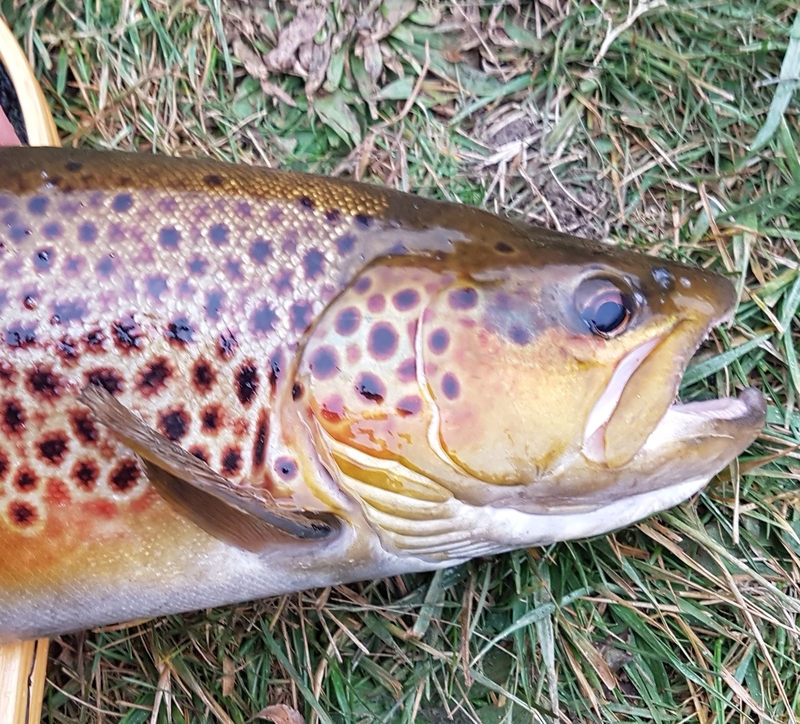 Remember as we start to get into the Brown trout spawning season and the madness that ensues, we all need to have some respect for these beautiful fish and the anglers that fish for them. I’ll touch more on that next time! In the mean time get ready for some insane fishing to come. Remember to drop into the shop to stock up on all your sub-surface flies and gear. We have an incredible range of spawning patterns available. Its December already folks and a visit from Santa is just around the corner! The fishing over the past month has been absolutely awesome and it only looks to get better. We have seen some great hatches of insect life with everything from Caddis, Mayflies, Stoneflies, and beetles starting to really come out in force, and some fantastic midge fishing opportunities on both lake Jindabyne and Eucumbene in the late afternoon to evening. 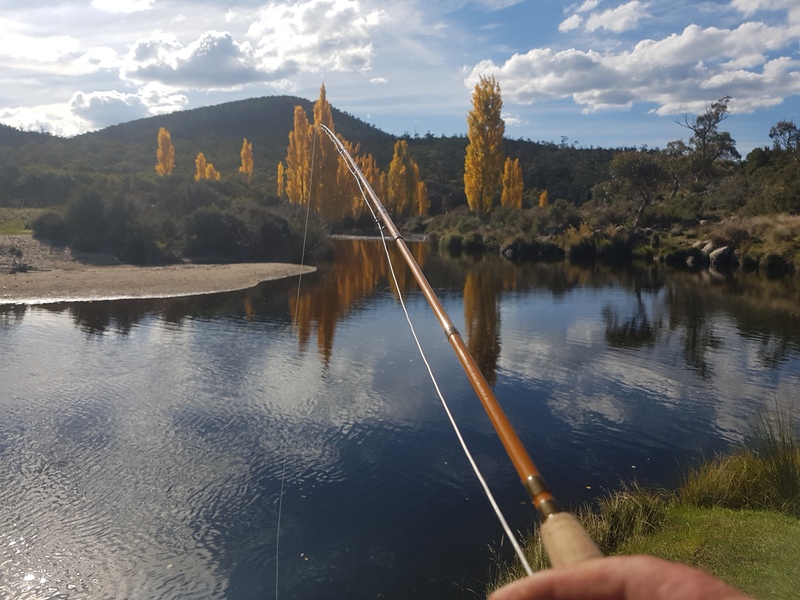 Thredbo River has been fishing as good as it has in years. the upper section (from Skitube up to Dead horse) has been fishing a lot better than the lower section (Gaden Hatchery to the Lake) with plenty of fish eating off the surface all day long. Black spinners seam to be the most popular item on the menu, Although just about any smaller fly around the #12 – #16 sizes presented with a good drift will usually be the undoing of an unsuspecting fish. On the warmer days with full sunlight the fish will be seeking refuge under the banks or in the deeper holes on the river. 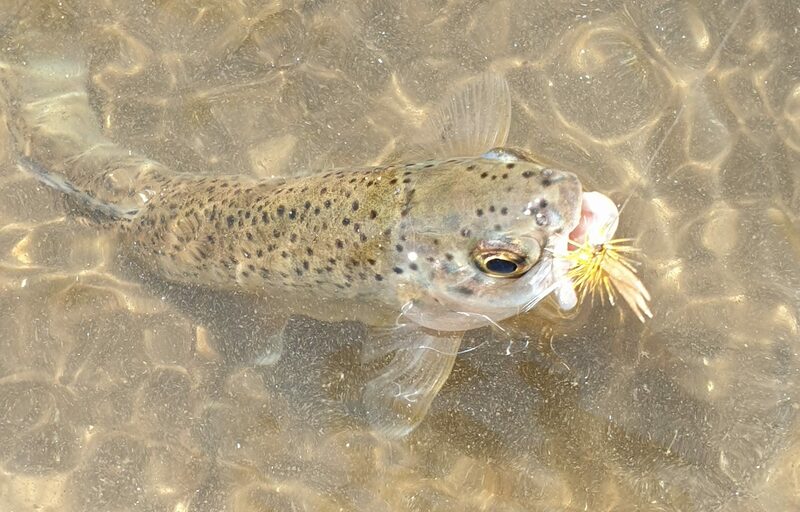 An unweighted nymph drifted under the undercut sides of the bank can often coax out a hungry trout. MoonBah/ Mowambah river is another little gem of a waterway with many access points for the angler to get on to the river. This smaller river fishes very well all day long on dry flies at any time of the day. Smaller emerger patterns are the way to go at the moment. #16-#18 Klinkhammer or parachute Adams being the go to flies for this water. Lake Jindabyne has been quite high and steady at around 86% and is fishing quite well in the late afternoon right through to dark and beyond. Mudeye and Damselfly nymphs are great prospecting flies throughout the day, with midges and beetle patterns for dusk and dark. Lake Eucumbene is sitting steady on around %52 and seeing some fantastic midge action in the evenings. A midge buzzer underneath a Griffith Gnat is a great way to entice a midge eater. The smaller alpine creeks and streams are also worth a look! Not only are they some of the most beautiful waterways in the area they can also be the most productive waters with many anglers coming away with in excess of 30-50 fish a session. A small #2 or #3 rod can be a fun way of dry fly fishing in any of the multitude of small creeks and streams. With summer in full swing and some of the best fishing going, its time that you came down to Jindabyne for your summer break. We have all the info on where and when to catch fish. We can also organize any guiding or tuition that you may require!!! Happy Holidays and Merry Fishmas!